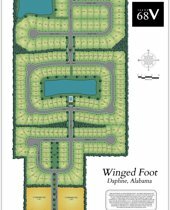 Winged Foot is one of the newest communities in Daphne, AL. Winged Foot subdivision will have 199 Residential Lots with new homes. This location is a total of 68 Acres. Phase 1 was completed in December of 2017 with 79 Lots. Amenities include a pool, Clubhouse, and Playground. D.R. Horton will be the exclusive builder in this neighborhood.